Just enough height for getting into taller vans or trucks. Easy to carry and light weight. 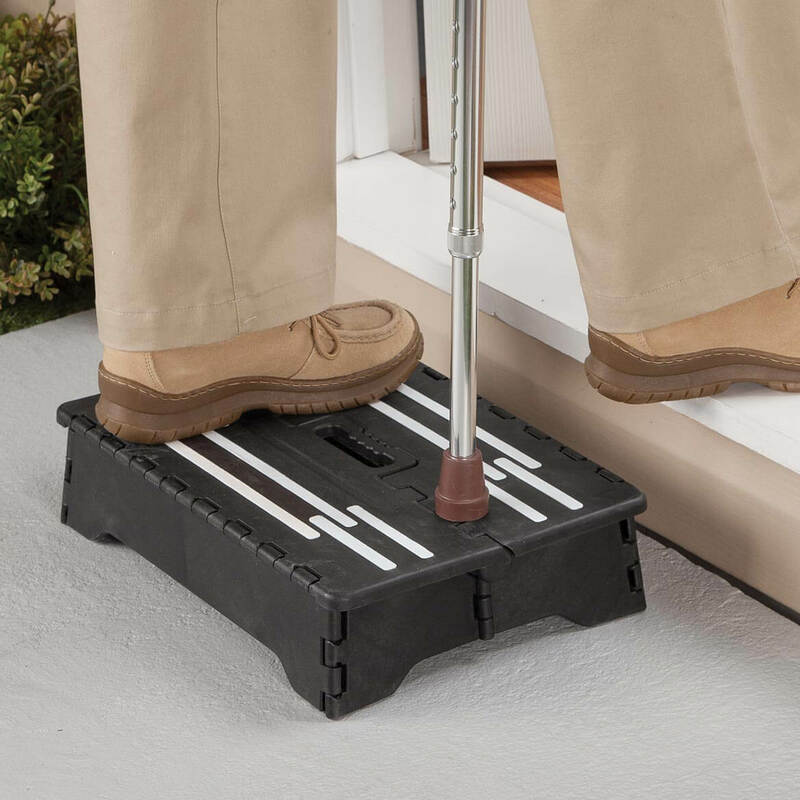 This portable step is exactly what I was looking for. It gets me just the few inches off the floor I often need. Everything else I'd tried had a deeper step so with my disabilities was far less safe. I bought two. One to keep at home and another to keep in a friend's car. I'm short and it gives me the extra few inches I need to get in her van and then folds easily to store out of the way. While it doesn't appear to be the sturdiest of steps (t's a wee bit wobbly), I feel secure on it. Just be sure to open it fully. I bought this step for my 90 yo mom to get into my Ford Edge easier. She love it. The 4" step makes it so much easier to get into the vehicle. A perfect extra step to put down under our RV step. I am not tall, so when we use the RV or pickup truck, it gives me that needed extra step down. 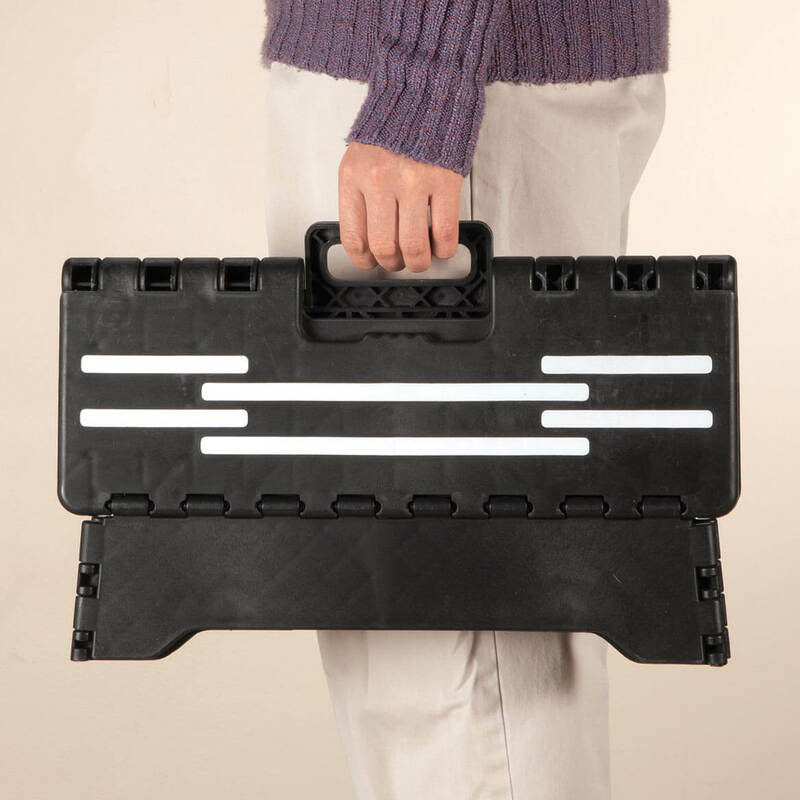 It is compact and lightweight, yet very sturdy. I ordered two and I'm glad I got two so we don't have to move them from one vehicle to the other. I use his for my elderly mother to step up into my truck. It works wonderfully. 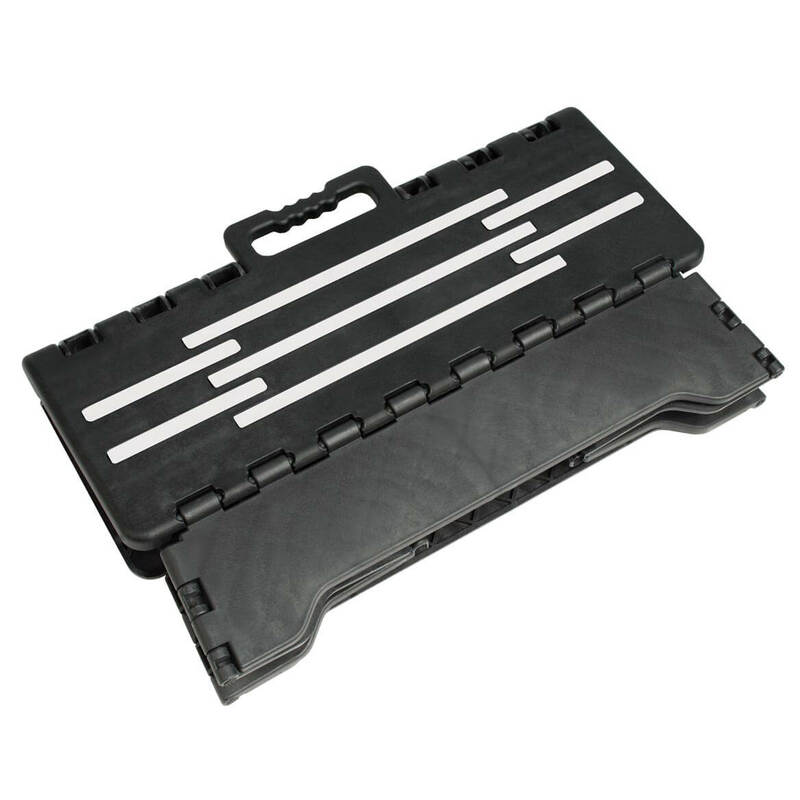 A lightweight and portable way to overcome high steps getting into a car, bus or dwelling. Wonderful use to put feet on when working at a desk. Perfect height. So glad I found the product! My car sits higher than my Mom's van and this little step up helps me get her in and out of my car. It is very sturdy when she stands on it and her safety is very important. It is just the right height as well 4". Most of the ones you see in the store or 6 inches or more which is too high for an elderly person. It folds down and easy to carry in my car. To some that few inches may be nothing but to us who are short it is like climbing a mountain, then when your legs hurt those inches are a mountain. this does help. Gives me just enough extra height to help getting in and out of the bathtub for my shower. I love that all I have to do is pick up the handle in the center and it automatically folds for storage. This product is just what I need at a reasonable price. There are so many products to view it's great and everything is priced so well. have one for the car and another by my bed. Product Is a Great Help! I am "vertically challenged" (short), so riding in a big vehicle for long periods of time with my feet dangling because they don't touch the vehicle's floor is uncomfortable and causes my feet to swell. 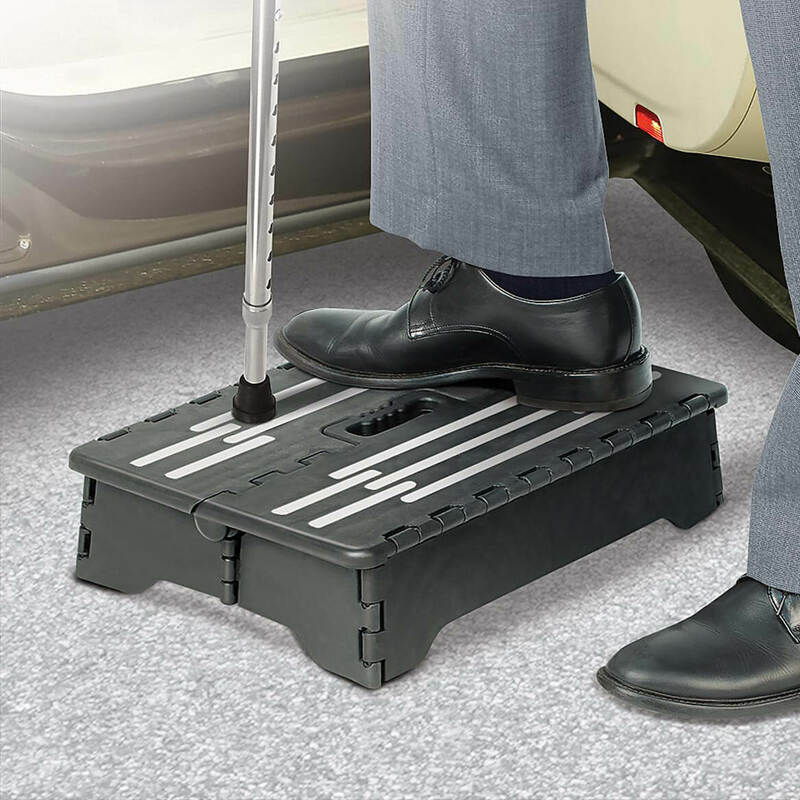 I ordered this portable help step to put on the floor of my husband's pickup truck and now my feet rest comfortably and no more swelling! It's the perfect height and folds up easily so it can be removed and stored with no problem. I had tried several other products and none has worked out as well as this step. We use the product in our car so my wife's feet are 4" higher when sitting in the car. I ordered a total of three of these steps. One I am using for our RV and the other two for a transit bus co. On one of the steps. The side hinge pin fell out, causing that side to collapse. We have had no trouble with the other two steps. I have to honestly say that I like them as they are the perfect height and collapsible. But it is unfortunate that the one step had the pin fall out and the one side of it collapsed. The person did not get hurt as the driver was right there, but it could have been worse. It is not to be used on tile floors. All it needs is something on bottom so it won't slip. I think the manufacturer should make it useable on tile ( kitchen ) floors. 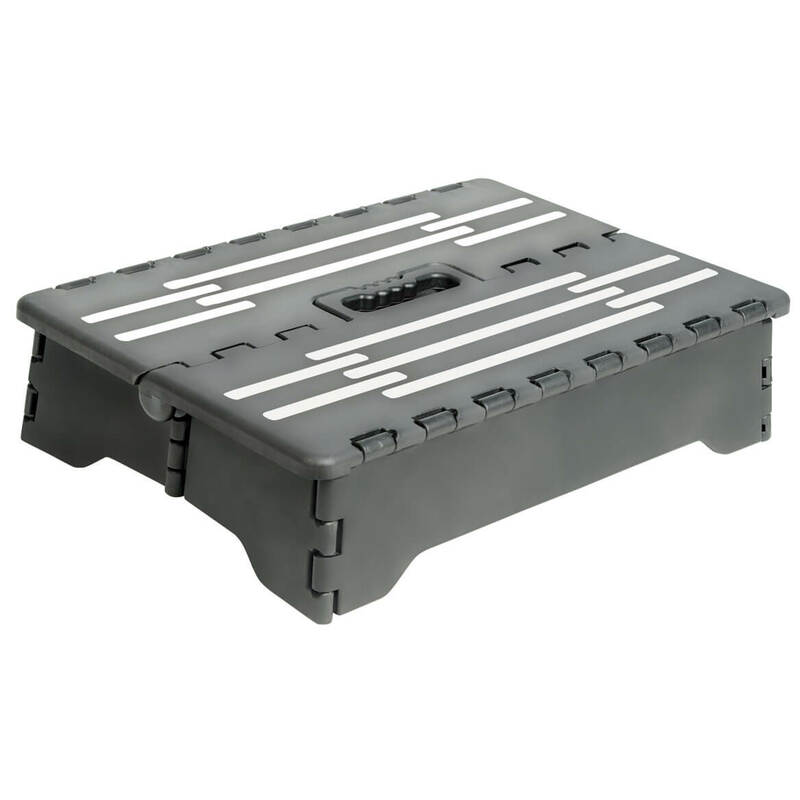 The step is the perfect size but it needs grippers on the bottom so that it can be used on any type of floor. TELL THE MANUFACTURER TO PUT THE LABEL ON TOP OF THE SHRINK WRAP, NOT UNDER IT. The label came off in little strips 1/4 inch by 1 inch. and after 30 minutes of fingernail ruining work, it still took using hand sanitizer to rub and roll the last of the label off. I do recommend it because of the height and sturdyness. The step is okay, just one problem with it. You have to make sure that you step down in the middle of the step. I missed and stepped down on the edge and it folded up and I went down. You have to see where you are stepping. Be careful. All I wanted this step for was to get into my elevated bed more easily. So stepped on once or twice a day only. After a couple of days, I realized the hinges on each side were broken. I carefully placed the step. Now one whole side has broken out, causing me to almost fall. I weigh 40 pounds below the 300 weight limit. I think all of the successful 5-star reviews must be for people well below the weight limit. If your loved one is below 200 lbs. I think you'll likely be happy. Otherwise, DON'T BUY THIS ITEM. Dangerous. This company needs to reevaluate the weight limit and make adjustments to the description. The center piece is too long when it is unfolded. So when using as a step, it is very wobbly. I tried putting extra skid pads on all four corners to raise the height so the center piece wouldn't hit, but they come off easily. It acts more like a see-saw than a step. The skid stripes on the top surface were buckled and coming off when it arrived. I feel very unsure having my disabled mother use this. I bought this for my father so he could have an easier time getting into a vehicle. He is 70 lbs. below the weight limit and he stepped on the step and it broke ! Cheaply made and I am furious that I wasted my money. Not safe for elderly parents. I wanted the step for a little extra height to get in my car but it did not feel sturdy enough like it would slide on the floor of my garage. Went to send it back the cost to send it back was more than what I paid for it. I liked the idea but using it today I stepped on it and the whole inside end broke off. I took a very hard fall, nothing broken but really sore. I am under the weight limit for this product so don't know how it broke like that. I think there must have been a faulty spot where the material was molded. So needless to say would not recommend it now. To get into higher cars, but folds easily. Need a step to assist my getting into my daughter's car. Easier to get into our truck! Easy to transport and great for a short step up. We have a 6" step up to get in the shower, but when stepping out it is 8". This step is just right to help get in and a big help getting out as we age. This will help our older friend to get in our SUV. Use at work. Have to stand and Chop for long periods, helps to put a foot up every little while. Works great! It is difficult to get into the back of my minivan. My husband is disabled, and the wooden steppers we have are starting to fall apart with age. This looks like it might provide a solution. My disabled husband has a hard time getting into our higher bed...and into the car. I'll also use it, so my grandson can reach the sink, to brush his teeth. Needed about 4 inches of additional height while facing my face at a new sink recently installed in the bathroom.. I'm short and find it hard to sit in chairs because my feet never touch the ground. I needed just a small, but sturdy step into our RV. I need access to a high patio step. I had previously purchased one so that my mother and mother-in-law could get into my van easier. My mother liked it so much that she wanted me to order her one to help her get into her bed easier. It’s the height to help me get into my truck. Stool + running board+ in the truck to leave. because of the height, it is easier to use a small step when recovering from surgery or have arthritis than a normal size step. because it is portable. I hope it will help me navigate several deep steps I encounter on a regulas basis. I used a friend's and decided I need 1 of my own. My new bed is higher than the old one and the height is exactly what I need. Plus I can easily get it out of the way when not needed. NEED EXTRA HEIGHT FOR GETTING INTO CUPBOARDS. Our front step in front of our house is higher than normal step height. I hope this will help people step up to our front step easier. comfort, to elevate feet while reclining. I needed a step stool lower that the stool I had, for getting into the car. It works fairly well, even though it's "plastic" and not great looking. It folds up and is wide enough to get your feet on it. Hopefully this will help my friends be able to step up on the steps to my side door. They are spaced a little high apart and some have trouble getting up on the steps. I am handicapped and have issues with climbing more than 4" 's in depth at a time. I'm short in stature anyway as well. This product will help me a lot! needed a step, to help get up the first step of the camper, I think that this will work great !!! to assist while going up stairs & transportation. My mother in law has a hard time getting on the bed due to the height of the bed she needed something to help a little bit. I'm really short and my family has a SUV. Can I stand on it folded double? How high would it be? BEST ANSWER: It gives you 4 inches of height. You can't fold it double as you lose the leg height because that's the part that folds under when it's folded. I have one for the truck and one for my bed. Works great because it folds up. Is it non-slip on the bottom?? BEST ANSWER: Thank you for your question. There are non-slip rubber grips on the bottom to help keep in place. We hope this information will be of help to you. not as much as I wanted; but, I added some pieces of rubber (evenly spaced on all legs) and now works just fine. I would say on a dry level surface, yes. What are the dimensions width- height- length? BEST ANSWER: Thank you for your question. It is 16" wide x 12" deep x 4" high. We hope this information will be of help to you.